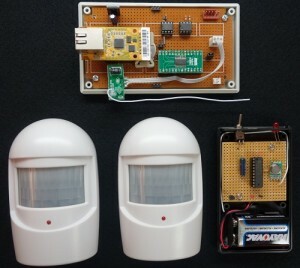 David Penrose’s “Sentry” project comprises an array of passive IR sensors placed throughout a building to track motion. 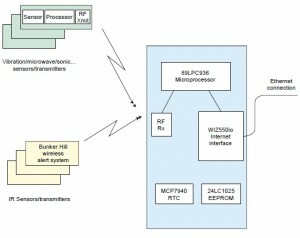 The microcontroller-based system comprises an RF link to a processor along with an Ethernet module to unobtrusively monitor motion and activity levels. Photo 1: The Sentry system uses commercial IR motion sensors (lower left) together with a customer vibration sensor (lower right) to determine where an individual is within a building. The base unit (top) integrates reports from these sensors to generate alerts to a caregiver. My Sentry System is designed to assist those folks living alone who desire the peace of mind provided by a caregiver looking after them without the caregiver having to be present. Its implementation was facilitated by the WIZnet WIZ550io Ethernet module, which provides a rich yet simple interface to the Internet. With a simple microprocessor, the system allows the status of a resident to be continuously monitored in a minimally intrusive fashion. Any abnormal conditions can immediately be alerted to a remote caregiver for action. In this way, a caregiver’s smartphone acts as an alert system by letting them know when a resident’s activity deviates from a normal pattern. The system is designed to be simple to set up yet very flexible in its application so the needs of different residents can be addressed. A resident with minimal needs can be monitored by a set of relaxed rules, while a resident in need of more continuous observation can be assigned a set of strict rules. In all cases, the overarching design approach was to provide a system that augments the caregiver’s capability. The Sentry System integrates motion sensors, a microprocessor, and the WIZ550io Ethernet interface to monitor a resident and report abnormal activity patterns to a remote caregiver (see Photo 1). The relationship of these subsystems is illustrated in Figure 1. Figure 1: Up to eight sensors transmit activity to a base unit processor, which checks for abnormal behavior of a resident. Alerts to a caregiver are generated and communicated over the Internet. The primary sensors are IR motion sensors. These can be augmented by vibration sensors, pressure mats, ultrasonic, and other devices capable of detecting a person’s presence. These sensors are placed at key locations in a resident’s home to monitor movement from room to room or within rooms. The vibration sensors are placed in favorite chairs/couches or in the bed to determine if the furniture is occupied and if there is normal activity. All of these sensors are battery powered and report over an RF link. The RF reports from these devices are received by a base unit which then compares the resident’s location and activity to a set of rules that define normal behavior for different times of day. Any deviation from normal results in an SMS text message or e-mail being sent to the caregiver along with information about how to contact the resident. In most cases, it is expected that the caregiver would respond by phoning the resident to check on them. The system is designed to be easy to install and operate. The WIZ550io’s Internet interface is used to communicate to a browser allowing the caregiver or resident to configure the system. This configuration consists of identifying sensors and rooms and describing a set of rules for each room for periods in the day. This local interface also allows for a review of all past activity once the system is operational. This history data is valuable for refining the rules to reduce false alarms and ensure security. Since the interface is behind the resident’s firewall, the system is secure from improper modification. 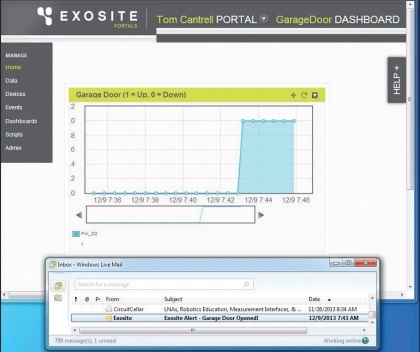 The key output from the system is the alert to the caregiver, which relies on the WIZ550io module communicating to a service site such as Exosite. The site generates the alerts sent to the caregiver. Photo 2: The base unit incorporates the WIZ550io, an 89LPC936 processor, a MCP79401 real-time clock, and a serial EEPROM to process reports received from the 433-MHz receiver. The system’s hardware consists of a base unit and multiple sensor/reporting units. 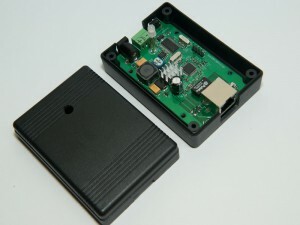 The base unit (see Photo 2) comprises a WIZ550io Ethernet interface, an inexpensive microprocessor, an RF receiver, a battery backed-up real-time clock, and a serial EEPROM. 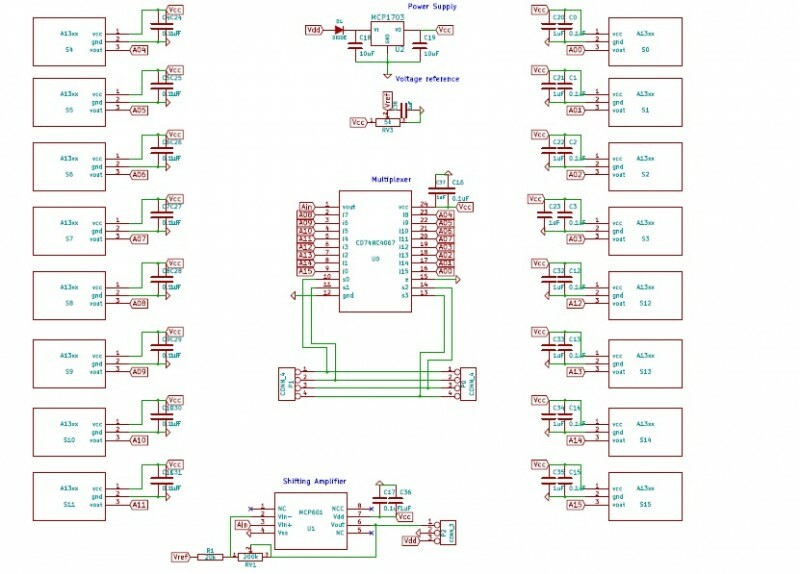 All of these pieces are integrated into a small form factor case and powered by a plug-in transformer (see Figure 2). 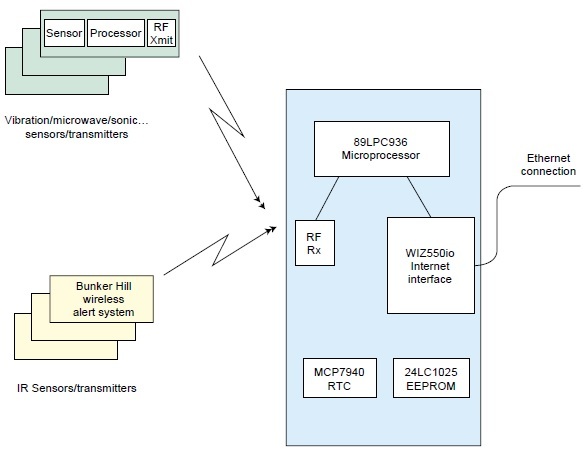 Figure 2: The microprocessor accomplishes all of its tasks while using only a few of the available port pins. The remote units can be one of many different sensor/reporting devices depending on the needs of the resident. The basic sensor is the IR motion sensor, which is available from a number of different sources. I used Bunker Hill Security sensors, which I purchased from Harbor Freight Tools (Item 93068). 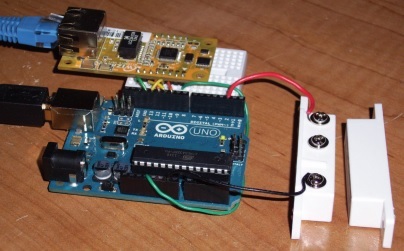 A sensor plus receiver is very inexpensive. Some cost only $11. The item consists of a sensor/transmitter and a receiver/alarm device. The receiver/alarm device is not used in this project although the RF receiver was lifted from one of these units to provide the receiver for the base unit. 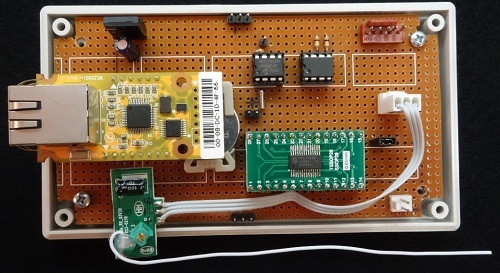 These sensor units are powered by 9-V batteries and report on an RF link at 433 MHz with a unique address code. 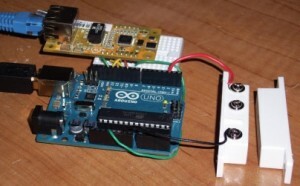 The code allows multiple sensors to be deployed and recognized by the base unit. 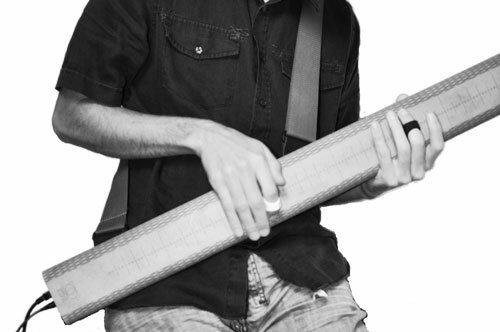 The complete article appears in Circuit Cellar 296 (March 2015). 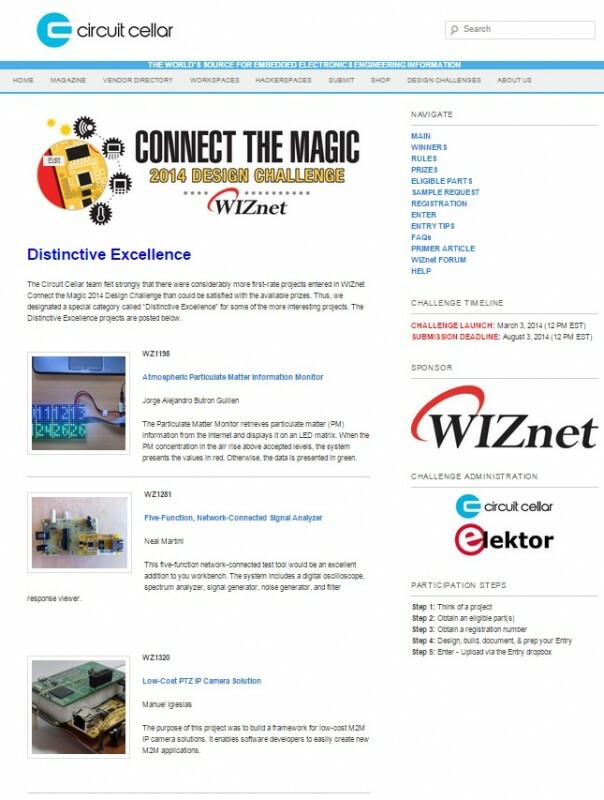 The Circuit Cellar team felt strongly that there were considerably more first-rate projects entered in WIZnet Connect the Magic 2014 Design Challenge than could be satisfied with the available prizes. Thus, it designated a special category called “Distinctive Excellence” for some of the more interesting projects. The Distinctive Excellence projects are now live on the challenge website. 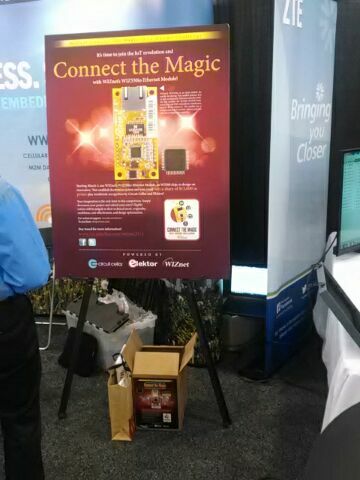 WIZnet’s Connect the Magic 2014 Design Challenge provided electronics enthusiasts with the opportunity to use WIZnet’s WIZ550io Ethernet module in a project for a chance to win a share of $15,000 in prizes. 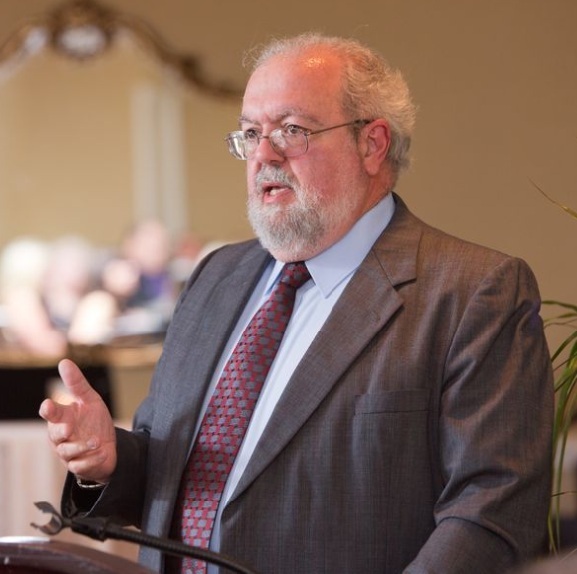 The submission deadline was August 3, 2014, and soon thereafter the judges began scoring the entries. We’re excited to announce that the results are now in and winning projects are live. You can study the complete projects (documentation, schematics, photos, code, and more) on the Winners Page. Congratulations to the following winners! 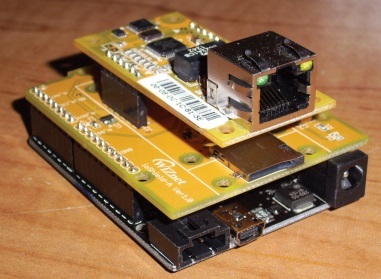 WIZnet’s WIZ550io is an excellent module for rapidly developing ’Net-enabled systems. 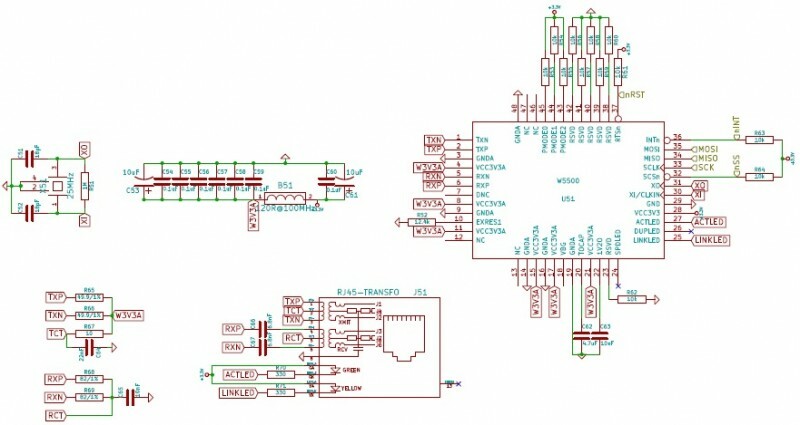 It is an auto-configurable Ethernet controller module that includes the W5500 (TCP/IP-hard-wired chip and PHY embedded), a transformer, and an RJ-45 connector. The WIZ550io has a unique, embedded real MAC address and auto network configuration capability. When powered up, the WIZ550io initializes itself with the MAC and default IP address and can be pinged from your computer. You don’t need to write MAC and network information such as an IP address, subnet mask, and gateway address. The WIZnet Connect the Magic Challenge offers you a variety of opportunities to show off your engineering skills and present your Internet of Things (IoT) designs to the world. It’s your shot to win a share of $15,000 in prizes, gain international recognition as innovator, and more. Don’t delay! The submission deadline is ​August​ 3, 2014. All Entries must be received on or before 12:00 PM EDT on ​August 3​, 201​4​. To Enter, simply upload your Entry via the Entry Dropbox. Didn’t finish your project? You can still participate. If the deadline approaches and your entry is not complete, we still encourage you to submit your project or submit a project after the deadline. While only these on-time files are submitted to the judges, consider that there are many more opportunities for contest success, such as Elektor/Circuit Cellar’s “Distinctive Excellence” awards. While Elektor/Circuit Cellar must follow the Sponsor’s rules about submission and judging when it comes to the contest’s official prizes, Elektor/Circuit Cellar is able to include its own award program that takes into account design skills that may otherwise go unrecognized. By submitting even an unfinished project by the deadline for official judging, you qualify for a Distinctive Excellence review. If there is merit and the project warrants further consideration, those projects that may be offered a Distinctive Excellence award may be updated by the entrant after the contest deadline. Plus … Due to Elektor and Circuit Cellar’s international reach, you’ll get even more exposure than ever before! Imagine getting a Distinctive Excellence award—or getting your article published—and being recognized by readers throughout the world! That could lead any number of positive outcomes. Job opportunities? Design deals? The sky is the limit! You are challenged to design and build an innovative project that uses least one WIZnet WIZ550io Ethernet controller module or W5500 chip. You can use any other MCU and/or module along with the WIZ550io Ethernet module. Your project must use at least one WIZnet WIZ550io Ethernet controller module or WIZnet W5500 chip. You can use any other MCU and other module along with the WIZ550io Ethernet module or W5500 chip. Visit the Eligible Parts page for more information. Participation is simple. First, read the Rules. 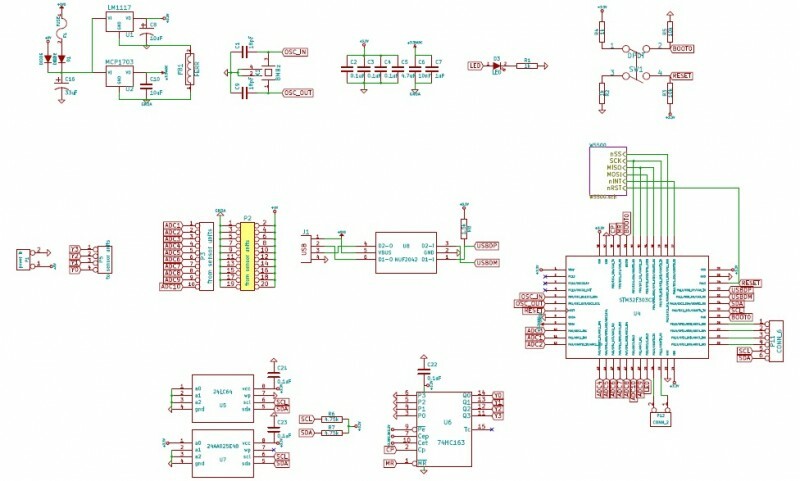 Second, build and thoroughly document a project featuring a WIZnet WIZ550io Ethernet Controller module or W5500 chip. Next, Register for the Challenge and obtain a Project Registration Number. Lastly, Submit a complete project Entry. The goal of the Challenge is to showcase the functionality of the WIZnet WIZ550io module. All Challenge entries will be judged by a panel of judges on the following: technical merit 30%, originality 30%, usefulness 20%, cost-effectiveness 10%, and design optimization 10%. It would be smart to highlight these achievements in your documentation. Call attention to your project’s special features. Good luck in the WIZnet Connect the Magic Design Challenge! The WIZnet Connect the Magic Challenge deadline is ​August​ 3, 2014. Let’s go over the challenge and cover some tips for entering. What devices must I use with my project? ​​May I submit multiple entries? Yes. You may submit as many entries as you want. Each Entry must have its own Project Registration Number. Complete a Project Registration Form for each Entry you intend to submit. What types of projects win design contests? The WIZnet Connect the Magic Challenge deadline is fast approaching — ​August​ 3, 2014! This is your shot to win a share of $15,000 in prizes and gain international recognition as innovator! We encourage you to finish up your Entry and submit! If you already submitted an Entry but want to update something, you must do so before the deadline. Didn’t finish your project? Consider this! If the deadline approaches and your entry is not complete, we still encourage you to submit your project. While only these on-time files are submitted to the judges, consider that there are many more opportunities for contest success, such as Elektor/Circuit Cellar’s “Distinctive Excellence” awards. While Elektor/Circuit Cellar must follow the Sponsor’s rules about submission and judging when it comes to the contest’s official prizes, Elektor/Circuit Cellar is able to include its own award program that takes into account design skills that may otherwise go unrecognized. By submitting even an unfinished project by the deadline for official judging, you qualify for a Distinctive Excellence review. If there is merit and the project warrants further consideration, those projects that may be offered a Distinctive Excellence award may be updated by the entrant after the contest deadline. Historically, there have been some really fascinating Distinctive Excellence projects for previous Elektor/Circuit Cellar design contests. Those who win this designation see their projects posted online similar to the official winners and enjoy much of the same exposure. Many are offered separate print magazine publishing deals through Elektor/Circuit Cellar. The benefits of having Elektor/Circuit Cellar recognize and publicize your work in a high profile campaign like this should not be underestimated. Due to Elektor/Circuit Cellar’s international reach, you’ll get even more exposure than ever before! Imagine getting a Distinctive Excellence award—or getting your article published—and being recognized by readers throughout the world! That could lead any number of positive outcomes … Job opportunities? Design deals? The sky is the limit! Today at EELive! in San Jose, CA, WIZnet announced a special promotion tied to the WIZnet Connect the Magic 2014 Design Challenge, which it is sponsoring. 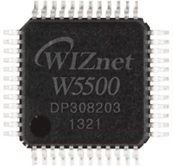 For a limited time, WIZnet is offering discounted WIZ550io Ethernet controller modules and W5500 chips via its webshop. Disclosure: Elektor International Media and Circuit Cellar comprise the challenge administration team. At this time, WIZnet’s WIZ550io is on sale for $9.95 (original price, $17.00) and the W550 cost $1.49 (original price, $2.87). 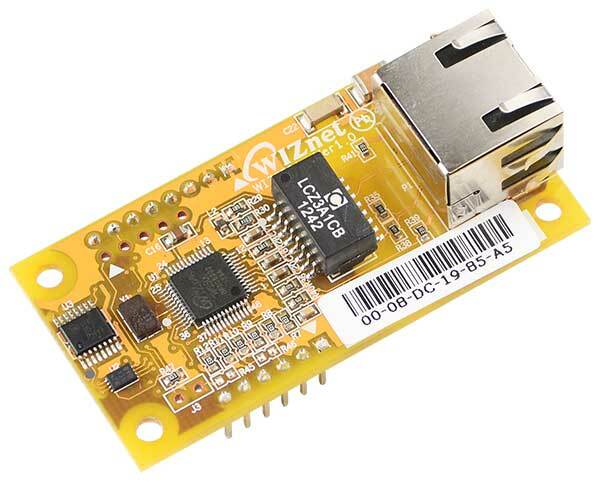 WIZnet’s WIZ550io is a module for rapidly developing ’Net-enabled systems. 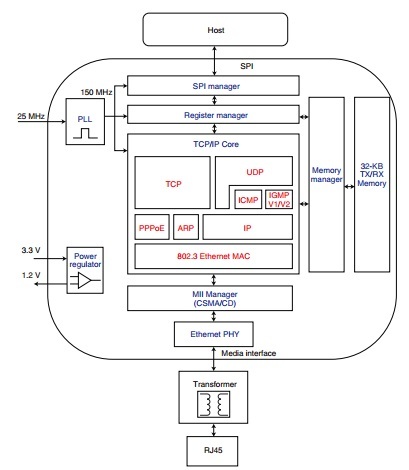 It is an auto-configurable Ethernet controller module that includes the W5500 (TCP/IP-hard-wired chip and PHY embedded), a transformer, and an RJ-45 connector. The module has a unique, embedded real MAC address and auto network configuration capability. 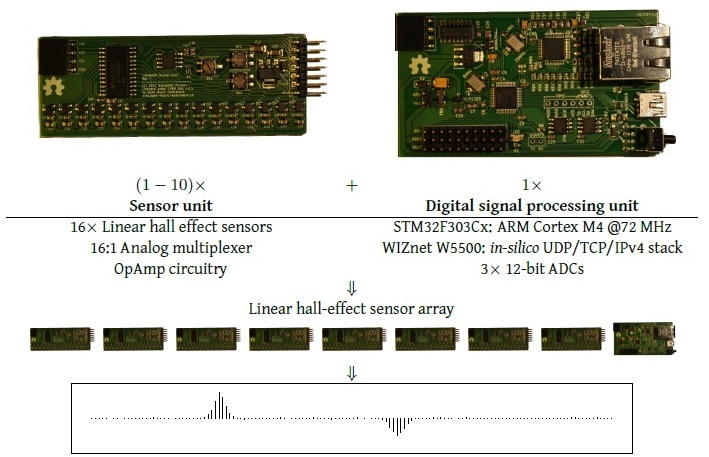 The W5500 is a hardwired TCP/IP embedded Ethernet controller that enables Internet connection for embedded systems using Serial Peripheral Interface (SPI). Visit the WIZnet Connect the Magic 2014 Design Challenge webpage for more information about participation and eligibility. As soon as the WIZNet Connect the Magic 2014 Design Challenge launched on March 3, 2014, Internet of Things (IoT) innovators—from professional electrical engineers to creative electronics DIYers—around world began requesting free WIZnet WIZ550io Ethernet controller modules. And due to the popular demand for the modules, the supply of free units ran out on March 11. Although free modules are no longer available, anyone with a WIZ550io Ethernet module, or W5500 chip, may participate in the competition. Participants can purchase eligible parts at shopwiznet.com or shop.wiznet.eu. The WIZ550io is an auto-configurable Ethernet controller module that includes the W5500 (TCP/IP-hard-wired chip and PHY embedded), transformer, and an RJ-45 connector. 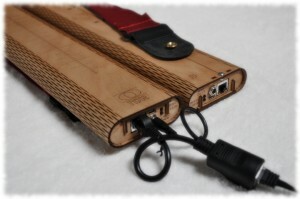 The module has a unique, embedded real MAC address and auto network configuration capability. The challenge is straightforward. Participants must implement a WIZ550io Ethernet module, or W5500 chip, in an innovative electronics design for a chance to win a share of $15,000 in prizes. The project submission deadline is August 3, 2014. For more information about the challenge, visit http://circuitcellar.com/wiznet2014/.